Who says adults can’t enjoy Harry Potter?! 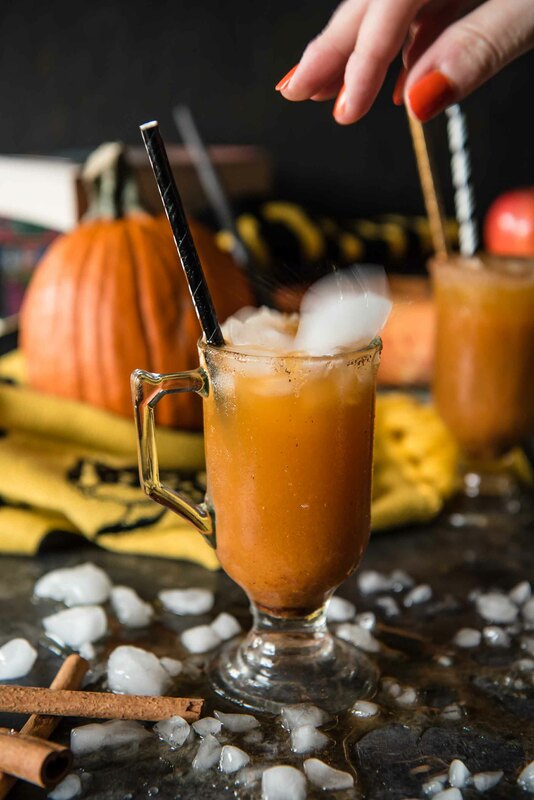 This “Grown Up” Potter Pumpkin Juice cocktail spikes Hogsmeade’s popular drink with bourbon whiskey, Slytherin style! I’ve gone and ruined your childhood, guys. Or made it better, depending on how you look at it. Have I ever mentioned that I’m a huge nerd? Oh yeah. Aside from my constant Disney visits, my Game of Thrones devotion, and my MMO obsession, I’m also a big book nerd. I’m into the classic epics – Lord of the Rings, The Hunger Games, and – of course – Harry Potter. I also enjoy cosplay. No jokes, guys…I own a Hufflepuff house robe. Yes, the one they wear in the movies. I’ve even got my own wand. And I’ve worn the whole Hogwarts student getup in public, unabashedly I might add. Every September 1st, I head to Universal Studios with my friends (shout out to my CFL Slug Club fam!) to celebrate the first day of school at Hogwarts. We get dressed up, sing the school song, ride the train from King’s Cross to Hogsmeade…and then usually end up at the Hog’s Head. After a few pints and hands of Cards Against Muggles, I’ve often found myself wondering why there were no adult versions of Harry’s favorite beverages served there. 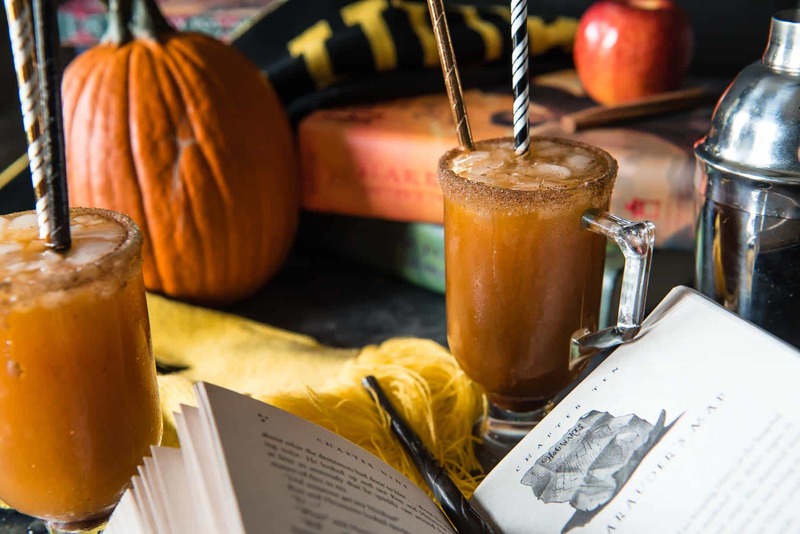 Pumpkin juice, Butterbeer – they’re both such perfect vessels for potion making with liquor. 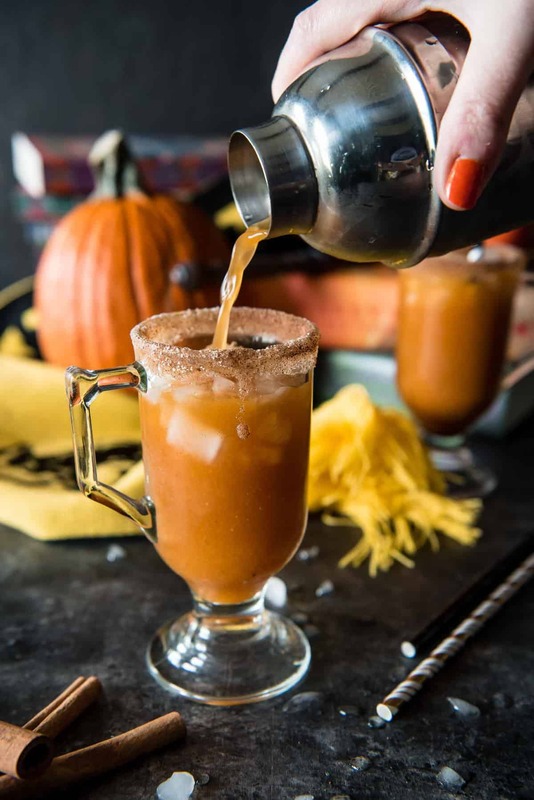 The bourbon warms up the cold juice, and compliments the pumpkin spice and apple cider notes that make up most of the drink. The flavor comes through just enough that you don’t forget that you’re drinking a cocktail, but not so much that you feel like it’s just a tumbler of bourbon. Also, the pumpkin juice base? Even better than the stuff at Universal. I have no idea what it tastes like in J.K. Rowling’s head, but in my opinion, I hit it on the nose. 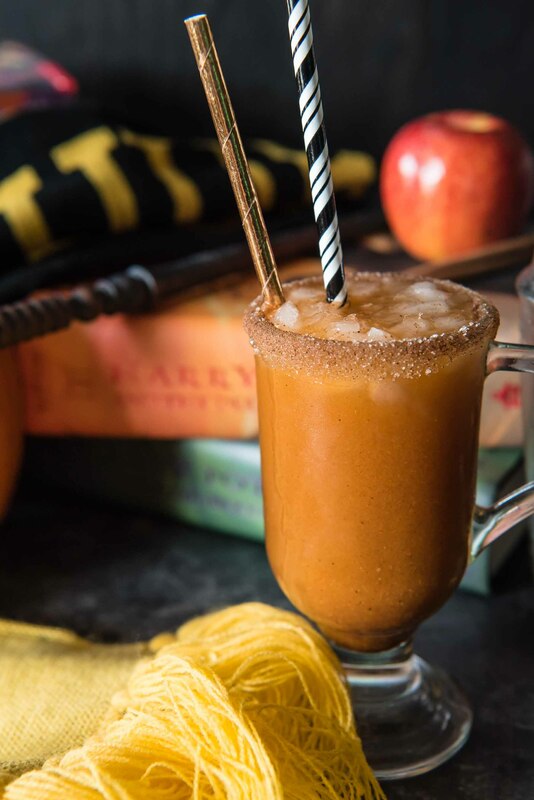 This Potter pumpkin juice was the first recipe I knew I was developing for Pumpkin Week this year, but I felt like it needed to be the last one I was sharing. After all, today is Friday. And I’m on a cruise, drinking things that are not this, but still very adult. Yay! 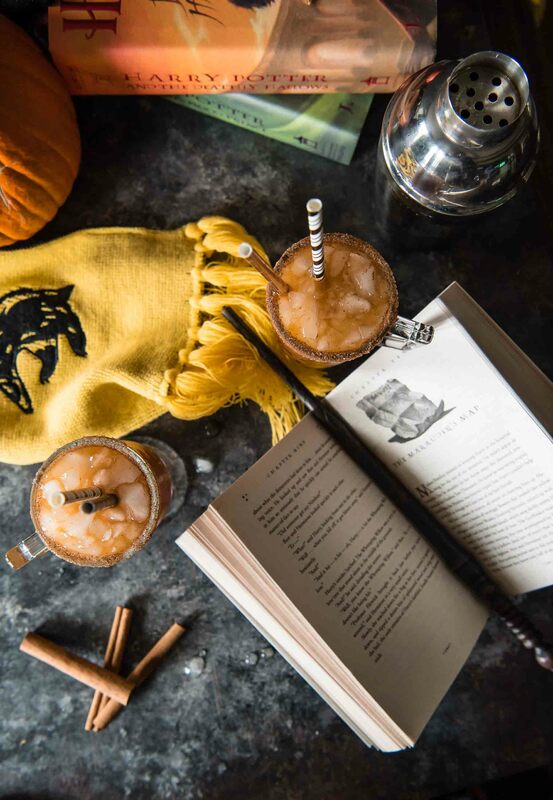 You’re obviously not, but maybe “me time” tonight could be re-reading your favorite Harry Potter novel (*coughGobletofFirecough*) with one of these. 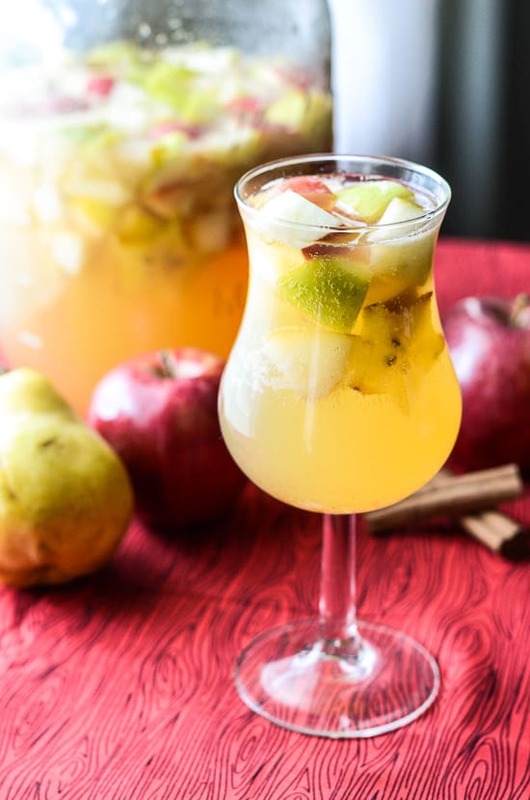 Or maybe curling up on the couch, binge-watching all eight movies this weekend with a pitcher of this juice is more your idea of a good time? And if there are kids involved, mix them up a few of these minus the bourbon – then sneak it into your glass and keep it close. Toss on your house robes, grab your wand, and prepare to recite the lines that are burned into your memory. You’ll be sharing your mutual love for Harry, Ron, Hermione & Co. in more ways than one! Who says adults can't enjoy Harry Potter?! 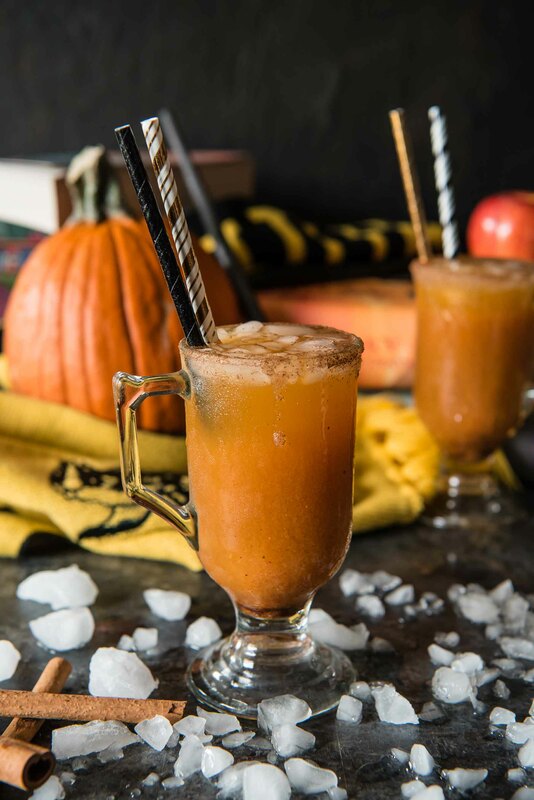 This "Grown Up" Potter Pumpkin Juice cocktail spikes Hogsmeade's popular drink with bourbon whiskey, Slytherin style! 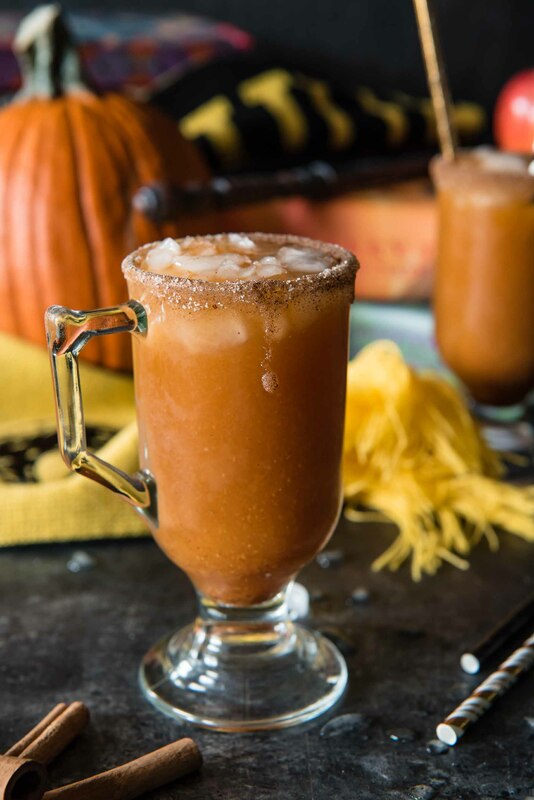 Dip the rim of an Irish coffee mug (or highball glass) in maple syrup, then dip it in a cinnamon-sugar mixture. Fill the mug halfway with crushed ice. Set aside. Combine all ingredients in a cocktail shaker and shake vigorously for 30 seconds. Strain into glass over ice. 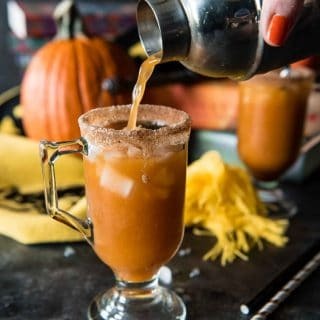 What a fantastic week of pumpkin recipes! 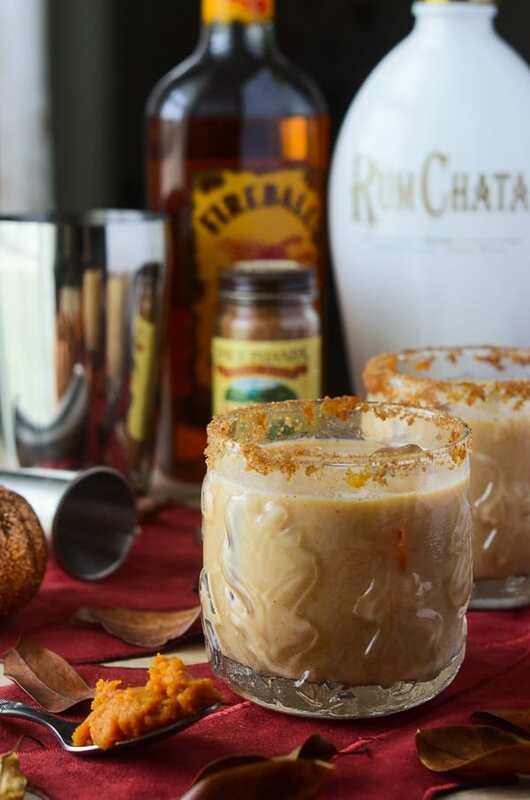 Here are a couple more cocktails to enjoy this weekend! So fun! I love this post’s connection with Harry Potter! If only wands were bottles of bourbon! Cute and looks delicious! This sounds amazing. I think bourbon was the perfect choice. You are absolutely just the cutest nerd I know! 🙂 I love the Hunger Games too! How cute is this! It also sounds SO delicious! I will need to make a batch on my next Harry Potter marathon!